These immunological rapid test kits are able to detect a target allergen on environmental surfaces, solid foods and clean-in-place rinse water. It is used for the qualitative detection of raw egg and egg powder residues in environmental samples. Egg products can also be tested with this kit after a preparation procedure that takes less than 10 minutes. 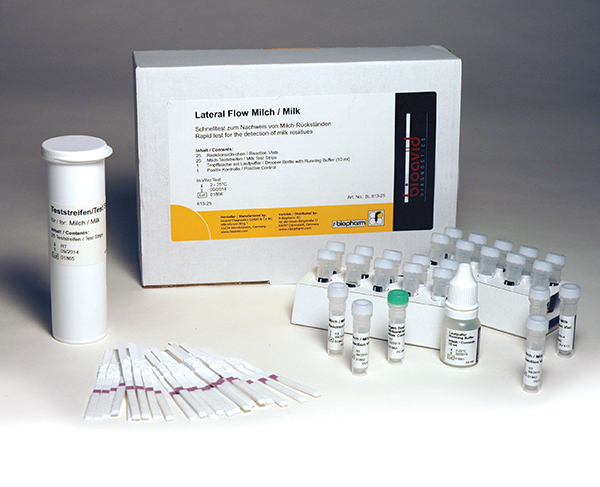 Reaction Vials – containing labeled antibodies in stabilized dried form. 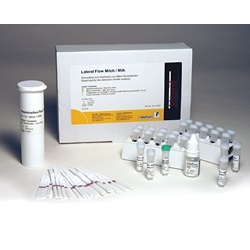 Allergen Test Strips – for the detection of antigen-antibody complexes. Dropper Bottle with Running Buffer (10 mL). Positive Control (reconstitute 5 mL with 1 mL water; use 0.1 mL per test). Not included: dropper pipets or micro-pipettors (0.1 – 0.2 mL). Sodium Chloride (NaCl) for solid sample preparation. Store the test kit at room temperature (2 – 25°C). Swab the area of interest using components of the Swabbing Kit (available separately – kit contains all materials for 25 tests). Release the sample thoroughly from the swab into 1 mL PBS-Tween. Add 0.2 mL into the assay (see below). CIP water: Add 0.2 mL directly into the assay (see below). Add 450 mL water and 4 g salt (NaCl) to 50 g sample and homogenize for 5 minutes in a mixer (equivalent volumes can be applied, e.g. 5 g sample in 45 mL water and 0.4 g salt). Filter the homogenate using a coarse paper filter or a syringe filled with glass wool until 0.1 mL filtrate is available, at least. Alternatively centrifuge at ca 2000 x g for 5 minutes. Proceed to assay. Add 7 drops or 0.2 mL of Running Buffer into the Reaction Vial. Add 2 drops or 0.1 mL of an extracted sample or CIP water into the Reaction Vial. Mix the content by carefully tapping the vial on the desk a few times. Insert an Allergen Test Strip into the Reaction Vial. Read the result at 3 minutes. One or 2 purple lines should appear in the reaction field on the strip. The upper line is the control line (see C). It indicates that the test has been performed correctly. The lower band is the test line (T). It indicates the presence of the target residue in the sample. One line is read as a valid negative result Two lines are read as a valid positive result Note: The photograph shows three Allergen Test Strips. The left one shows a negative result and the other two are positive (line at T). The test format is able to detect residues of sprayed egg powder down to 1 ppm. Only presence or absence of an analyte can be determined, but no quantitative result can be given. Very high concentrations of milk in a sample (> 1000 ppm) may reduce the intensity of the test line, or suppress its formation completely. If a sample is supposed to contain such high concentrations of an analyte, higher dilution of the sample is recommended.